This snippet, from a dialogue between two pandas in the evening's penultimate film, pretty much sums up the practice of one of the most original, irreverent, not to say eccentric, experimental filmmakers of the 1960s and '70s. Witty and inventive, parodying not just the languages of mass culture, but the sophistries of the avant-garde, the films of the American artist Owen Land (a near anagram of his given name, George Landow) are based in philosophical games, using wordplay and optical ambiguity to explore the materiality of film, the role of the spectator, and the illusionary nature of cinema itself. Fleming Faloon | 1963. 7 min. 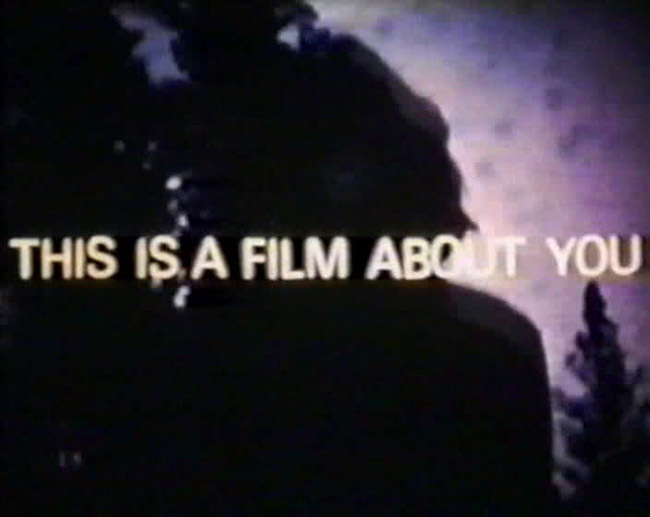 Film in Which There Appear Edge Lettering, Sprocket Holes, Dirt Particles, Etc. | 1965-66. Silent. 4 min. Institutional Quality | 1969. 5 min. Remedial Reading Comprehension | 1970. 5 min. Bardo Follies | 1967. Silent. 20 min. On the Marriage Broker Joke as Cited by Sigmund Freud in Wit and its Relation to the Unconscious or Can the Avant-Garde Artist Be Wholed? | 1977-79. 18 min. New Improved Institutional Quality: In the Environment of Liquids and Nasals a Parasitic Vowel Sometimes Develops | 1976. 10 min. Total running time: approx. 68 min.